Home/cubicle extenders/What Kind of Cubicle Wall Stack On Tile is Best? There are two basic types of cubicle wall stack on tile. The first is the kind you get from the manufacturer of tile based systems. These are common in some of the high-end, ultra-thick panel designs. You can add or take off tiles to increase or decrease the height of cubicle walls as needed. 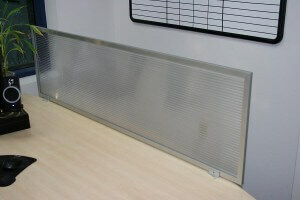 The other kind is a universal tile or panel extender that works on most cubicles regardless of brand and up to 3” thick. Which one makes the most sense for your company? Stackable tile systems that you get from a major manufacturer like Maxon certainly look good. Plus, they can be reconfigured throughout the lifespan of the cubicles. What you might not take into consideration is how much work goes into specifying what components you need. You don’t necessarily know for sure up front which workstations need higher walls and which ones are OK with lower walls. So, you’re basically guessing when you place an order. Plus, reconfiguring may sound easy, but it can entail a lot of disruption to actually accomplish with a traditional stacking tile system. Finally, those extra tiles can be pretty pricey! In contrast, panel extenders can easily be added or removed at any time in just a few minutes. There’s no need for disassembly of existing walls or rerouting of cables and wiring. They are much more cost effective than traditional stack on tiles and easier to specify. You can even have yours customized with fabrics that match or complement your existing cubicle panels. There’s no downside!